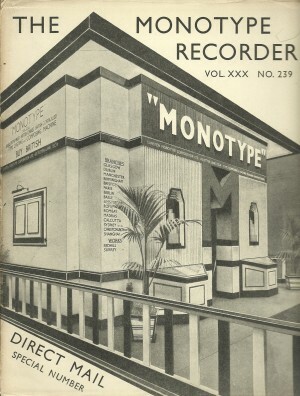 The Monotype Recorder was a trade magazine published by the Monotype Corporation. It was published for about 70 years from 1902 – it almost ceased publication during World War Two. Beatrice Warde was a long-standing editor. Over 60 issues are available here in PDF format. We are greatly indebted to John Cornelisse for scanning in his personal collection, and making them available here on Metal Type. If you can fill some of the gaps in this collection please get in touch. Content Summary: Charles Nicholas Cochin; Progress in Graphical Arts; Gleanings from Trade Journals; A specimen of Cochin Roman and Italic. Content Summary: The French National Printing Office; Close versus wide spacing; Inserting rules in tables. Content Summary: Tendencies in book printing; The Oxford University Press; Modern fine book printing – a review. Content Summary: How Monotype stands up to long runs; Reaching maturity; Printing and the printer of the future; A remarkable Monotype production. Content Summary: The Selling of Printing; A folder that made 2,500 per cent dividend; This edition set entirely in Bodoni. Content Summary: A conspectus of printing; Our new sports field; A private press with a private type foundry. Content Summary: Talking in Print; The Monotype composing room; The modern Press advertisement. Content Summary: A musician at the keyboard; Letter-spacing and unit-adding in Monotype composition; Pictures of the Monotype. Content Summary: William Maxwell – Printer of Books; The next President; The Printing Trades Unions and their Industrial Interests. Content Summary: Craftsmanship; Efficiency in the Monotype room; J W Printer discovers a publicity asset; Technical queries on Monotype operation. Content Summary: The Fifty best printed books; The serrated mould eliminates rising spaces; Our guests from America; Mr Punch and the Monotype. Content Summary: Sonnet for a printers’ specimen book; Public Printer Carter of Washington; The Oxford University Press – a remarkable exhibition. Content Summary: Keep posted with direct mail; Putting the shop on parade before the customer; Problems of the letter-head. Content Summary: Typography: A statement of policy; Towards a Nomenclature of letter forms. Content Summary: The development of the point unit of type measurement; Technical queries; The printer stationer. Content Summary: Old-face types in the Victorian age; Technical queries; A Russian Baskerville. Content Summary: The Monotype – from infancy to maturity, 30 years of Monotype Recorder; set in Bembo. Content Summary: For the glory of the craft; Respect for letters; The Monotype at Olympia; Falstaff specimen. Content Summary: Charles Knights on the local printer as a propagandist; Plantin super-sizes; The printer’s library. Content Summary: Further towards a nomenclature; How was this copy set? Content Summary: Obselete printing should be scrapped; Some years ago I set down the setting-stick; Monotype attachments. Content Summary: On the choice of typefaces; The advantages of printing from type; A comparison of various Monotype book faces. Content Summary: A sketch of the origin and growth of the printing craft in Yorkshire; Some typographic questions; Signor Silvio Massini – 30 years. Content Summary: A printer considers the book; Livening the type book; Type Metal; A letter from Mr Eric Gill. Content Summary: Aspects of periodical typography; Operators Diplomas – an announcement; Large sizes for small spaces. Content Summary: Prometheus in the printing office; Typography of the menu; Top 50 books of 1933. Content Summary: An article on the printed catalogue; Remarks on advertising conventions. Content Summary: My Shakespeare; Hints on tabular composition; Monotype Plantin – a specimen. Content Summary: Books at Burlington House; Back Along – Memoirs of a Comp; A new Monotype mould. Content Summary: Need school books be dismal, repellent? Recent good book production; The leading attachment is real news. Content Summary: The changing newspaper; Body faces – interesting comparisons; House-set ads, vexed problem nearing solution. Content Summary: Book special; Penguin Books now standardised to Monotype Imprint; Justifying overset lines. Content Summary: Pictures of modernity in type composition; New ways with type Book 2; Technical queries. Content Summary: A note on William Caslon; A specimen of Monotype Albertus; -ise or -ize Garfield Howe sums up. Content Summary: The organisation of a Monotype machine department; Maintenance of temperature of metal and moulds. Content Summary: Large textbooks; Sixpennies; The code book; A book of our own (tabular composition); Privately commissioned books. Content Summary: Forty historic years and what they brought about in the composing room; Printing The Times; A memorable family party. Content Summary: Monotype Bembo; Monotype Van Dyck 203; Monotype Bodoni; Monotype Bell; Monotype Centaur; Monotype Perpetua. Content Summary: Typographic problems of the illustrated book; How paper alters the face; Copy fitting; Specimens of two new book faces – Emerson and Times Wide. Content Summary: Monotype machines at Earls Court; Looking up the train; Combined spacing for caster attendants. Content Summary: Monotype machines in the limelight; The Birmingham conference of operators; Quadding charts; Preparing a railway timetable. Content Summary: 150th Anniversary of the French Revolution; Many happy centenaries; Technicians corner. Content Summary: 50th anniversary edition; Illustrated account of the pioneer days of Monotype composing machines; Alphabets of Ehrhardt. Content Summary: 50 years of type-cutting, specimen books and type sheets. Content Summary: Technical number with an illustrated summary of post-war improvements. Content Summary: Special number of Typographical Transformations as exemplified in a before and after collection of recent books, periodicals and general printing. Content Summary: The fifth centennial of the invention of typography, the art of printing with moveable types. Content Summary: Monotype machines in the making. Showing a first selection of photographs recently taken at the Monotype works at Salfords, Surrey. Content Summary: The recrudescence of the small printer. Will Carter describes and illustrates his work at the Rampant Lions Press. Content Summary: We resume our tour of the works to see Monotype matrices and moulds in the making. Content Summary: Setting Mathematics, with a glossary of mathematical terms and nomenclature of signs by Arthur Phillips; Together with a note on the system of 4-line mathematical setting by the Monotype Corporation. Content Summary: The Typecasters; An illustrated history of type-casting by Ellic Howe. Content Summary: Typography for hospitality by the British Transport Commission. Content Summary: Commemorating the exhibition held at Monotype House of lettering and type designs by Eric Gill. Content Summary: The completion of the Monotype Walbaum size range; Walbaum’s early years in Goslar and Weimar; Print – a voice of the church. Content Summary: A grammar of type ornament; A new inscription for the printing school. Content Summary: Special issue dedicated to the users of Monophoto Filmsetters. Content Summary: Augmenting the Roman alphabet; Progress in PAA – with examples from experimental editions in Pitman’s augmented alphabet. Content Summary: Languages of the world that can be set on Monotype machines. Content Summary: Precision in map making. Content Summary: Stanley Morison 1889-1967. Content Summary: The Innovators; A review of the progress of Pictorial Machinery Ltd, 1919-1969.